SW Fashion: Christmas Eve Cocktails? Mmm Yes Please! Christmas Eve Cocktails? Mmm Yes Please! Blogging? At this ungodly hour on Christmas eve morning?! Perhaps i've had a wild night out and have stumbled upon my laptop in a drunken haze? Or perhaps I started a Good Housekeeping recipe for Ruby Braised Cabbage and Beetroot- to accompany le Turkey tomorrow, natch- at eleven and simply did not realise that said recipe required two hours of "gentle simmering"? I think you can which one applies purely by the detail of the latter. Yes, i'm a loser, i'll accept it and so shall you. Moving on, it's BLOOMING CHRISTMAS EVE! Where has 2012 gone?! Well if you need a reminder feel free to look at every other magazine's "review of the year" and you'll find out. My pick is Grazia's. But that's just because I love Grazia whole-heartedly and simply can't see past it. So what shall your Christmas Eve consist of? Lots of eating and wrapping I presume. Me and the family shall be taking a last minute dash up to Princes Street *cough* Harvey Nicks to pick up any last minute Christmas bits and bobs, and of course stopping for a much needed light lunch at Yo! Sushi (because I flaming love Spicy Pepper Squid almost as much as my Mulberry). I am also hoping to begin planning my mighty sale shop (i'm on the hunt for a bargainous designer handbag to get for my upcoming birthday- have you any suggestions or hints, PLEASE comment below or tweet me!) so as to work out the gaps in my wardrobe and where my stash of Christmas vouchers/moneys can be best spent! I think Whistles may be the first stop. The coats are quite gorgeous and there's a black jumpsuit that I NEED! Fear not, however, as I will be posting several great sale finds to pick you all up from that post-Christmas slump that I dread! My favourite Christmas indulgence, however, would be my bubbly and for a little Christmas Eve treat I shall share with you my three latest fizzy fixations to make that bubbly a little bit more special this year! Be it Champagne or Asda Cava (a favourite tipple of mine! ), these sparkly cocktails are festive fun in a flute. Much love! Doesn't it just sound magical? A drink with such a delightful and sweet name could never be that naughty, surely? 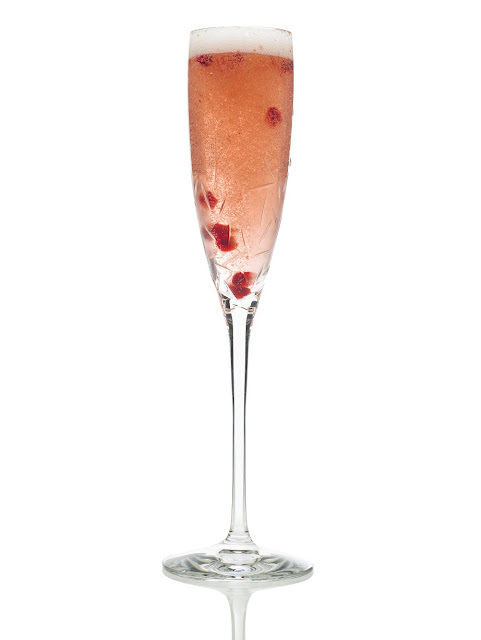 The Twinkle is a lovely champagne based cocktail with a fragrant hint of Elderflower to boot. The flavour combination is sweet, but delicate and it is a very light and chic cocktail. The original way to make a Twinkle is to mix a little elderflower cordial (Waitrose have them in abundance, Belvoir do a lovely one) with a little vodka and top up with the fizzy stuff. Or you can make it a little easier by buying a bottle of St Germain Elderflower Liquer and simply adding that to your bubbly. Enjoy! Now, obviously, this is not of my own invention but it is the girliest Champagne cocktail going and really is delectable. I first had it when having lunch at Laduree in Harrods with my mum, on a classically rainy London day. The charming waiter offered us each a complimentary cocktail and a couple of macaroons as "ladies shouldn't have to go out in the rain", and I opted for a Laduree. It is simple to make- just like the Twinkle or a Kir Royale. Simply put a little baby pink Rose syrup (Monin do one- but it is a little hard to find!) in the bottom of your glass and top up with Rosé Champagne. The colour is gorgeous and delicate, and the rose flavour is subtle but sweet. It's like a rose macaroon in a glass!